This machine transfers onto many flat surfaced items, such as fabric, metal, wood, ceramic & glass. Ideal for applying transfers, letters, numbers, and images on t-shirts, garments, bags, mouse mats, jigsaw puzzles, ID bages, ceramic tiles, and other items. 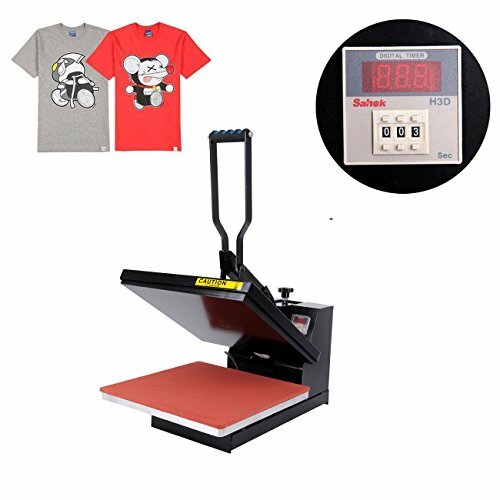 Large size - 38x38cm is big enough for most of your heat transfer requirement Don't buy a machine less than this if you are mainly doing t-shirt heat transfer. Fashion design, reasonable structor, arrives fully assembled and ready to use (printer and paper not included). Special front pressure adjust more convenient. Digital LCD timer - Preset desired time and automatic alarm will sound when time is complete; helps avoid over exposure. Digital LCD temperature control - Digital controller makes setting more accurate. Set the desired temperature and element will stop heating when preset temperature is reached. High pressure - Let you do a better t-shirt heat transfer. The higher the pressure, the better result on the garment. Teflon-coated element - Unlike other machines with bare-metal heating elements, the element on this machine is teflon coated. The surface is easy to cleaning and non-stick, preventing scorching of transfers, and does not require a separate silicone/teflon sheet. Note: The Machine must be use three-core socket which is come with ground protection, and it must be use the leakage protection switch. High Quality and 2 Year Warranty;CE Certification;Low Maintenance and Fast Shipping From US warehouse. Shipping time is about 2-6 business days.